Pablo Picasso (b. 1881, Málaga, Spain; d. 1973, Mougins, France), the son of an academic painter, José Ruiz Blasco, began to draw and paint from an early age. Picasso studied first at the Fine Arts School in La Coruña and practised illustration and drawing caricatures at home. While studying at La Lonja Art Academy in Barcelona where his father had been appointed professor, he frequented the café Els Quatre Gats, the gathering place for a group of artists, musicians, and others who were crucial to his early artistic development. In summer 1901, Picasso held his first Paris exhibition at the Galeries Vollard. In 1904 he moved to Paris, settling in the Bateau-Lavoir studio in Montmartre. His circle of friends soon included Guillaume Apollinaire, Max Jacob, and Gertrude and Leo Stein, as well as two dealers, Ambroise Vollard and Berthe Weill. Picasso’s style developed from the Blue Period (1901–04) to the Rose Period (1905), leading him to the pivotal work Les Demoiselles d’Avignon (1907). The years 1906–07 marked his discovery of Iberian and African art. In the years from 1908 to World War I he experimented with Cubism, with the subsequent evolution from an Analytic phase (c. 1908–11) to a Synthetic phase (beginning in 1912–13). In 1910, Picasso designated Daniel-Henry Kahnweiler as his official art dealer. In February 1917, the artist traveled to Rome with Jean Cocteau to work on the ballet Parade. There, he met his future wife Olga Khokhlova. Soon after, his paintings and drawings came to be characterized by large, neoclassical compositions featuring nudes and figural representations. In 1930, Picasso bought the Château de Boisgeloup near Gisors, where he set up a sculpture studio and further developed his sculptural work. In 1932, Christian Zervos published the first volume of the catalogue raisonné on Picasso’s work (1895–1906). In 1935, the artist started to associate with the Surrealist group, which met at André Breton’s place in Paris. The Spanish Civil War profoundly affected Picasso, inspiring his large-scale painting Guernica (1937). 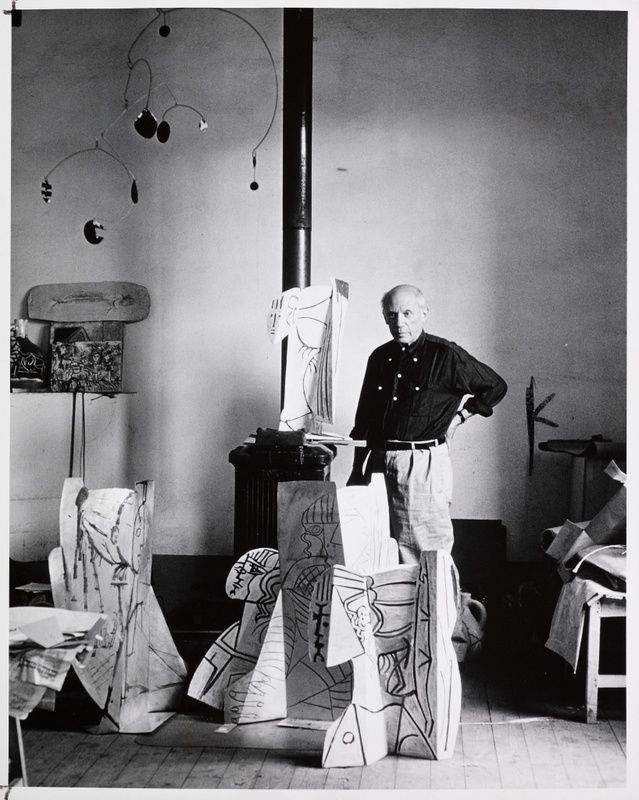 From the late 1940s Picasso lived in the south of France. After Olga’s death in 1955, he acquired the Villa la Californie, located above Cannes. In 1961, he married his second wife Jacqueline Roque, subsequently moving to Notre-Dame-de-Vie in Mougins. In the 1960s, he produced several paintings inspired by masters such as Monet and Rembrandt, as well as on the theme of painter and model. The year 1969 was an intense period of painting; subjects included portraits, couples, nudes, men with swords, smokers, and still lifes. Among the huge number of exhibitions that were held during the artist’s lifetime, those at the Museum of Modern Art, New York, in 1939; at the Musée des Arts Décoratifs, Paris, in 1955; at the Grand Palais and the Petit Palais, Paris, in 1966; and at the Palais des Papes in Avignon, in 1970 were among the most significant. Picasso is buried at Château de Vauvenargues – a 14th-century castle located near Aix-en-Provence he had acquired in 1958 – at the foot of Mount Saint-Victoire, an iconic subject in a number of Cézanne paintings.